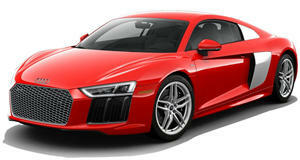 Looks like the Audi R8 is going to trade its quattro AWD system for RWD. Last week, Audi previewed what we can expect to see from the German automaker at the Frankfurt Motor Show, including the long-awaited reveal of the RS4 Avant and a couple of electric concept cars showcasing the future of fully autonomous car tech. Intriguingly, the automaker also confirmed that Audi Sport will be showing a new limited-edition rear-wheel drive performance car at the show. We had a strong suspicion Audi was alluding to the rumored rear-wheel drive variant of the R8 V10, and this latest teaser all but confirms that suspicion. Uploaded by Audi’s social media channels is a short but sweet video of a white R8 with red accents performing some tire-shredding donuts, implying that its renowned quattro all-wheel drive system has been swapped for a rear-wheel drive drivetrain. What we don’t know, however, is whether this tail-happy R8 variant is powered by the same naturally aspirated 5.2-liter V10 engine as the standard car that produces 532-hp, or the more potent 602-hp unit that powers the R8 V10 Plus. Only the base model of the Lamborghini Huracan is available with rear-wheel drive, so it seems likely that only the standard R8 will be getting the same treatment. Just imagine all that monumental power being sent to the rear wheels. Those tires are going to be begging for mercy. Another possibility is that this could be the entry-level turbocharged R8 Audi is working on with a twin-turbo 2.9 liter V6 from the RS5, but that seems less likely. We don't have long to wait to find out what Audi Sport is cooking up, as the Frankfurt Auto Show kicks off tomorrow.